Our extractors use an elegant patent-pending process employing heat differentials to control the extraction process. This eliminates the need for expensive mechanical pumps and specialized infrastructure. This results in a price a craft grower can easily afford. What is the extractor capacity? 2, 5 or 16 ounces of properly-prepared raw material. 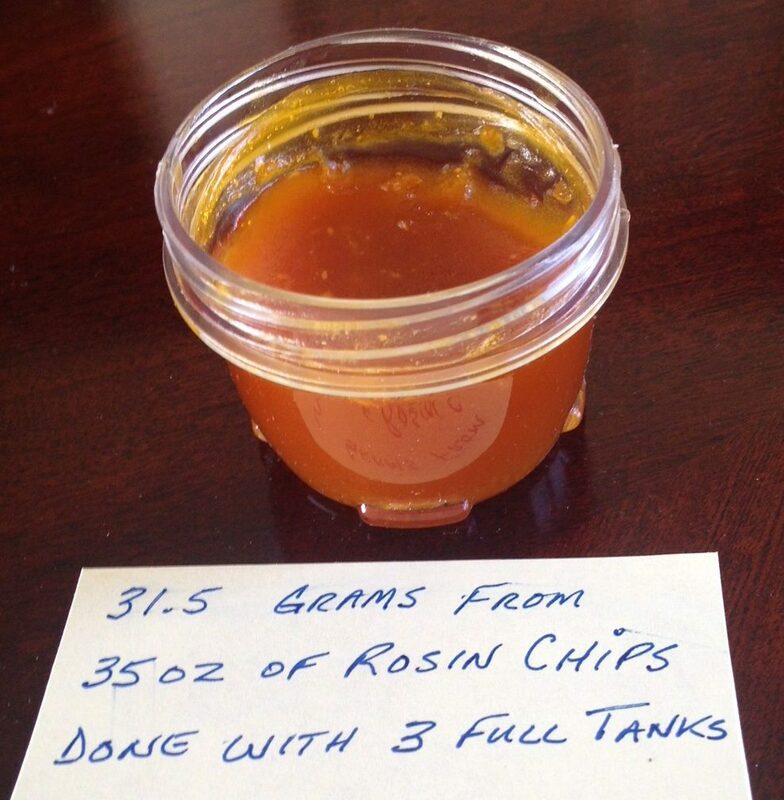 Typically, the 16oz model can process up to 25lbs per month, the 5oz can process up to 10lbs per month, and the 2oz can process up to 3lbs per month (these capacities can be doubled if using post-pressed rosin chips – see below). Using multiple extractors can inexpensively increase capacity. Rosin leaves a lot of cannabinoids in the post-pressed chips. How do we know this? Because one of our customers put a bunch of post-single-pressed chips into his extractor and extracted a LOT of very potent, terpy oil – see the picture above. Even if you are rosin-dedicated, you can use our CO2 extractors to maximize the yield from your post-pressed chips! Yield-by-weight and yield-by-target-compound are not the same thing. Once most the target compounds have been extracted, if the raw material is subjected to additional runs more extract may accumulate in the collector – but there may not be much target compound in it because most of the target compounds have already been extracted. After the target compounds are extracted, the CO2 (or any solvent for that matter) will continue to dissolve compatible non-target compounds, and while these compounds may increase the yield-by-weight, they do not increase the yield-by-target-compound. Actually, adding non-target extract to target extract simply dilutes the target compound content in the overall mix. What is the yield of CO2 vs. other solvents? Generally speaking the yield-by-active-compounds of CO2 is similar to other solvents such as butane or ethanol. HOWEVER, because the CO2 doesn’t extract as many non-active compounds, the yield-by-weight by CO2 will usually be significantly less. How much extract can I expect to get? Assuming fully-dry, fully-decarbed, properly ground, high-quality raw material, and proper extraction process, tests have delivered between 8-12% yield-by-weight from a 50-50 mix of quality flower and trim. Trim alone can yield 5-7% by weight (depending on the quality of the trim). These yields-by-weight are less than other extraction solvents because CO2 extracts contain less undesirable compounds. Because there are less target compounds to extract as the extraction process proceeds, the amount of extract-per-unit-of-CO2 will decline as the process continues. d) decarboxylation (“decarbing”) – a carboxl group in a molecule can decrease that molecule’s solubility in CO2. Removing the carboxyl group by applying heat may increase the solubility and result in higher yield per Cycle. Generally speaking, raw material heated to 240F for 50 minutes will be satisfactory. Decarbing also helps to fully dry the raw material. There are many articles about decarbing on the Internet. How long does an extraction take? A typical 2oz extraction would probably take 4-5 hours but your attention is only needed for approx. 30 minutes during that period. A 16oz extraction can take 8-12hrs. Do I have to monitor the extractor when it’s operating? With 2oz and 5oz extractors, only when CO2 is being loaded or released for extract collection. When the raw material is “soaking” it can be left alone indefinitely. Extractors using the Auto-Flush mechanism allow the operator to start the extraction and then leave while the extractor runs unattended. The operator will have to change tanks when required. How much CO2 is recaptured? Expect to recapture ~90% of the CO2. Using an innovative approach the system is effectively “closed-loop” in that the vast majotity of the CO2 is recaptured and recycled. How long have these extractors been in the market? The first versions were introduced in 2015 and there are multiple versions installed over three continents. There have been four major revisions and the current highly-developed extractors are the result of years of extensive field-testing. Is there an operating manual and training? Yes, a detailed Operating Manual is provided. Email/telephone support is free for 90 days.